This was so much fun! 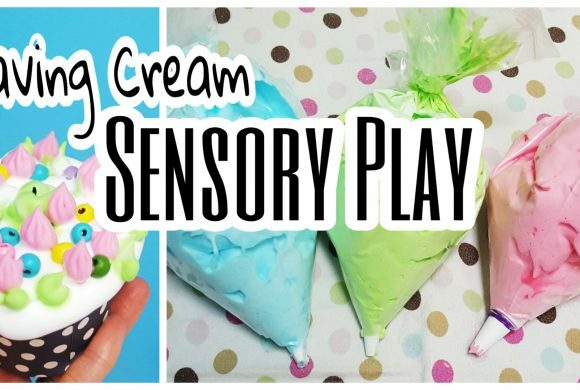 I love doing different sensory activities with kids. One of the classes that I teach has been studying space, so I thought this would be a great painting for kids activity that ties into the space theme. 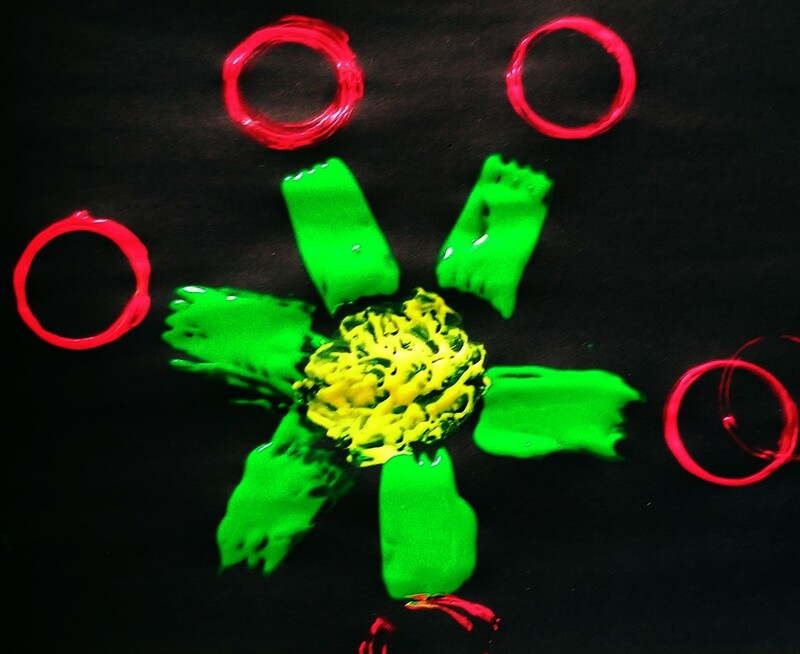 Kids love painting, and this was a way for them use paint, but in a different way. 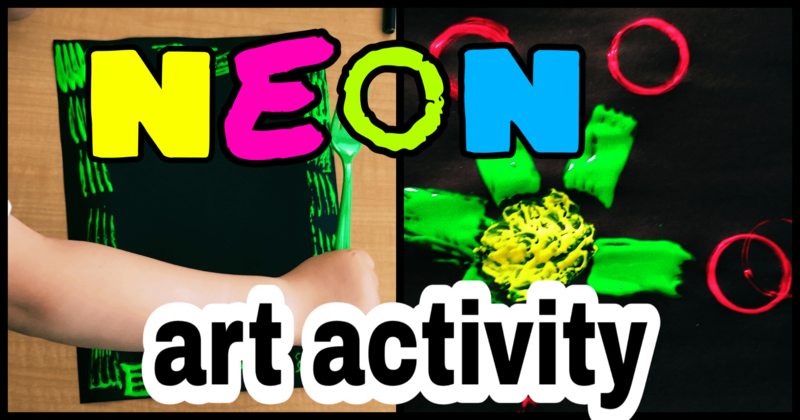 I started with three different colours of neon paint – green, yellow and pink. 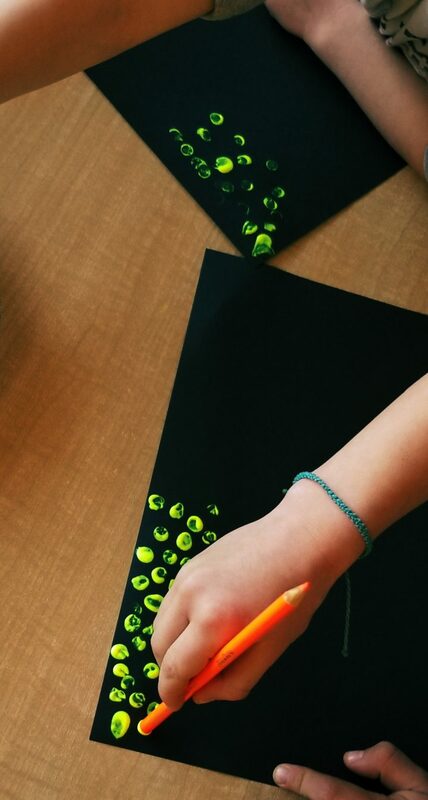 I used black paper as our background so that the paint would stand out and look like it was glowing. We had three different tools that children used to make their marks. I provided forks, plastic eggs and pencil crayons. With each paint colour I set out I placed one of the painting tools, i.e. with the pink paint I put only the plastic eggs. I then encouraged students to start painting! 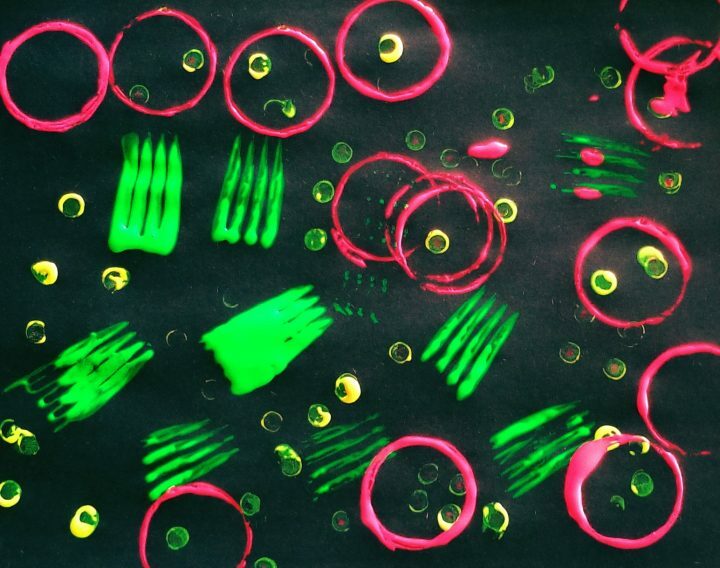 With the pencil crayons, we used the flat end to create a dot/circle print. 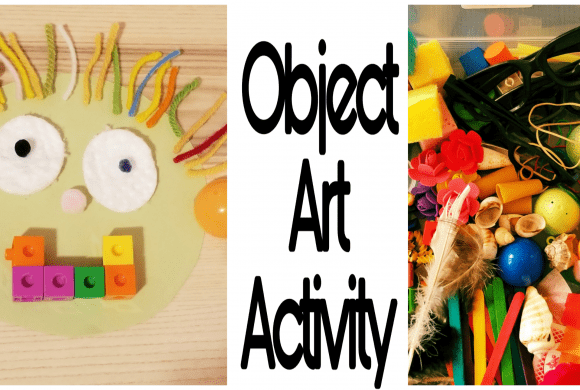 Using everyday materials, like pencil crayons in different way shows kids how simple art can be and how many different ways you can use regular objects. Everyone loved how vibrant the colours looked on the page. They also had a lot of fun using tools other than paint brushes to paint. 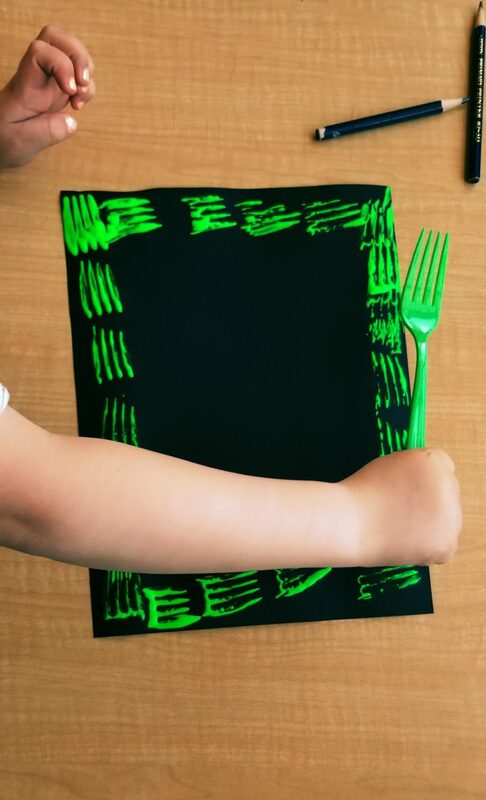 Some students had fun just using their tools to create different prints and markings. Other students worked to create a specific image. 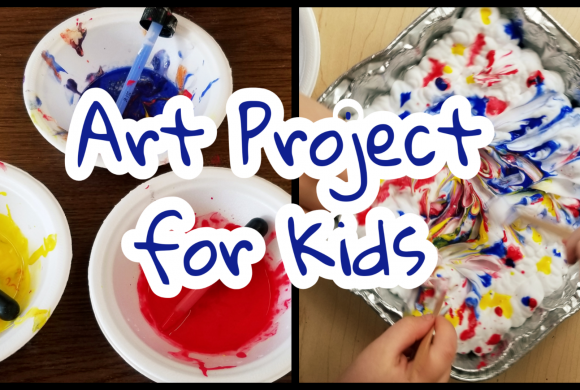 This painting for kids activity ended up being a great sensory activity. Both because of the glow/neon look of the paint as it is added to the black paper, but also because of the use of the fork, plastic eggs and the end of the pencil crayon. 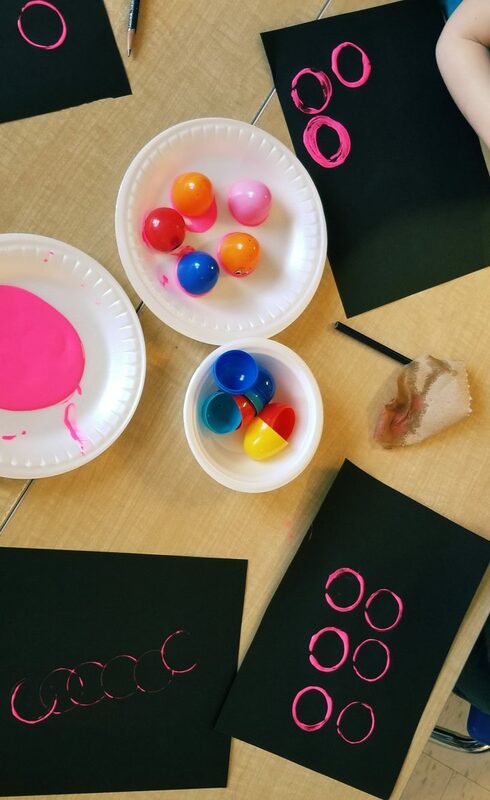 If you are looking for another activity to build on the idea of space and glow in the dark, I have tried a variety of glow in the dark centres with my kindergarten students. Click here for ideas.